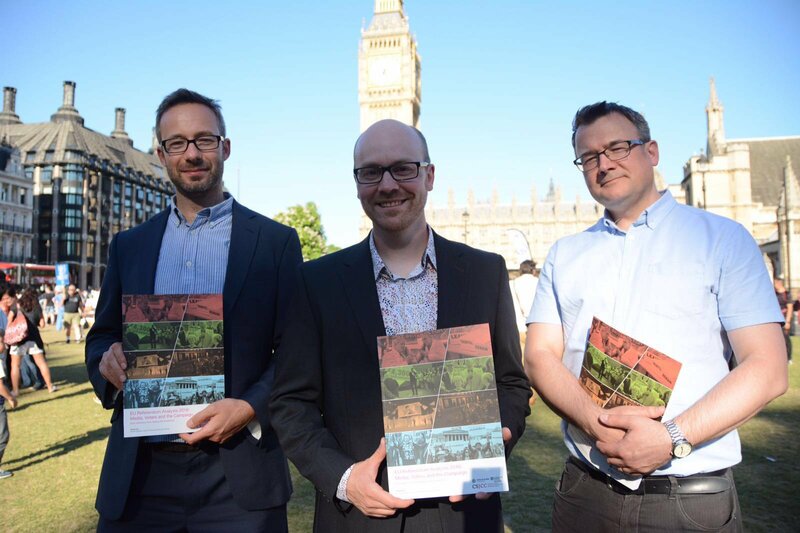 An EU Referendum analysis and opinion book featuring contributions from Loughborough University academics has been officially launched at Westminster. The book titled EU Referendum Analysis 2016: Media,Voters and the Campaign covers topics such as the language of prejudice, EU Referendum media coverage and the rhetoric of the EU Referendum campaign. It features comment and opinion from 100 academics from a number of institutions – sharing views on the Leave and Remain camps as well as the final Brexit outcome. The book, which was published just 10 days after the EU Referendum, was edited by Loughborough University’s Professor of Political Communication Dominic Wring, alongside Dr Dan Jackson and Dr Einar Thorsen from Bournemouth University. It has also been supported by the Political Studies Association. Among the 80 chapters in the book, one chapter is focused on how the news media covered the Referendum – this is the result of media analysis research by Loughborough University’sCentre for Research in Communication and Culture. The research team audited national news coverage of the Referendum between 6 May and 22 June. Hosted in Portcullis House in Parliament Square, the launch event was attended by MPs, MEPs, Lords and prominent academics, who all engaged in healthy debate about the outcomes of the Referendum and lessons that can be learned for the future. Dr Einar Thorsen, Principal Academic in Journalism and Communication at Bournemouth University, said: “We always felt that there was a bit of a gap between all the fantastic research that happens in academia and politicians, so we were looking for way to get all that expertise out there very quickly. The book is available to read for free in PDF form here. A second free event that brings together some of the UK’s leading researchers in the field to present early reflections on the Brexit campaign is being held in Leicester on Wednesday 27 July as part of the IAMCR pre-conference in Leicester.